If you're looking for a little help choosing your new best friend, this simple puppy personality test can help. 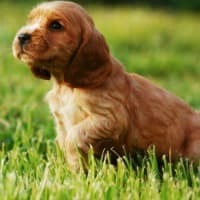 It's important to pick a pup whose personality, instincts and activity level are a good fit for your home and lifestyle. 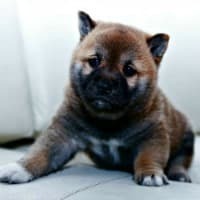 But, if you're a first time dog owner or haven't had a lot of experience with puppies it can be difficult to make the right choice when you're surrounded by a litter of tumbling, wriggling, yapping little cuties. Just follow the simple steps below to 'test' any pup that you're interested in - or all of them if you want to. 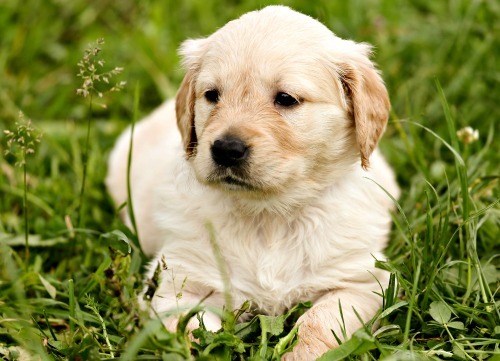 This type of test is designed to give you a glimpse of a puppy's basic temperament. Whether his basic nature is bold/timid, friendly/shy, bossy/docile etc. There are six basic puppy personality types and every pup will either fully, or mostly, fit into one of them. 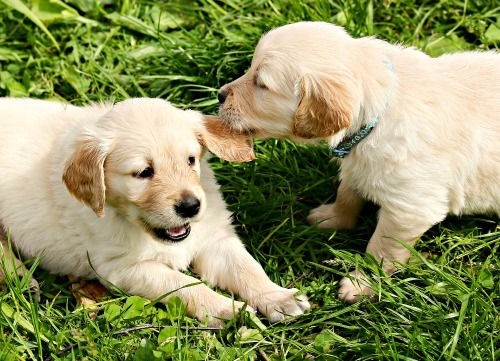 We can often get a good idea of puppys' personality by watching him play and interact with others. The ideal age to test a pup is at 7 weeks old, but anywhere from 7 to 9 weeks is fine. 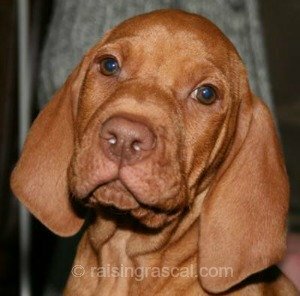 Even older pups up to around 12 weeks old can be evaluated the same way - the results may be less clear-cut but the basics are the same. Although these types of tests often measure reactions using the full six personality types, two of them are just different degrees of dominance and two are different degrees of submission. Bear in mind that there are variations even within each temperament group. For example, a dominant pup may either be pushy and brash, or aggressive and demanding. If you're considering a pup who falls into the dominant category you will need to have enough experience and confidence to be able to tell the difference, and be able to handle it. It's similar with a submissive puppy. He might be simply shy and gentle, but he could be fearful and anxious. If you aren't familiar enough with dogs to be able to tell the difference then this personality type is not the right choice for you. 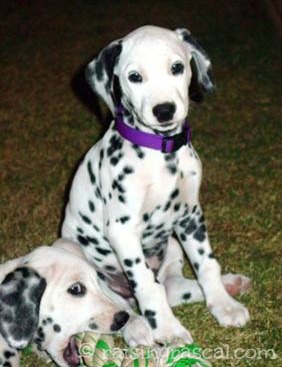 If you're looking for a family pet your best bet is a 'middle of the pack' type of pup and that's the 'docile' personality type. But again, not every docile pup will act the same way. Every pup is a unique individual, and plus breed-specific traits play a significant role. Puppy personality tests are also known as Aptitude or Temperament Tests. This page features a basic test which can help you choose your new family pet. It's a simplified version of some of the more complex puppy aptitude tests and one that I've used myself to evaluate puppy personalities. 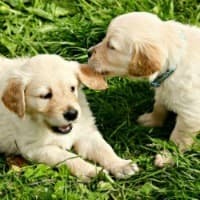 The perfect way to get a better idea of what type of basic temperament a puppy has, and more than enough to make sure that you have a good chance of choosing the perfect companion for YOU! If you're looking for a working, hunting or protection dog this test is not in-depth enough because there are other things you'll need to test for (such as noise sensitivity, touch sensitivity and retrieving instinct). You can tell a lot about a puppy just by watching him play and interact with his brothers and sisters. As with any family, there's likely to be a range of personalities. Usually one puppy will be the most dominant (the 'leader') and one will be the most submissive (the 'timid' one). The other pups will fall somewhere between these two. Outgoing and friendly or shy and reserved; bold and energetic or quiet and laid-back; independent free spirit or velcro-pup who's always following along. Doesn't steal toys or get into fights. May share or fight to get a toy back. If you want to get a sneak peek at how a litter of puppies behave together.... make it a stealth operation! Watching them unobserved will give you a better idea of who they are because once they see YOU and get excited this will change the way they interact with each other. Once you've taken a few minutes to watch the pups interact with each other it's time to do some hands-on testing yourself. The best thing to do is to start with the pup, or puppies, that you think has the temperament you're looking for (using the guidelines above). You can also test any pup who has the specific 'look' that you want, or who you're especially drawn to or seems to have chosen YOU. You'll get the best results by testing each pup one by one. Pick one and take him/her to a quiet spot away from the rest of the litter. Another room is best, but that's not always possible. Method 1: Put the puppy on the ground and bend down towards him. Stroke him gently but firmly from the top of his head, all the way down his back and over his rear end. Repeat this several times until you're sure that you can see how he reacts consistently. A dominant pup won't like this because this type of stroking/pressure is a dominant action in itself. He might jump up at you, paw or nip at your hands, or growl. He may struggle, wriggle or try to get away. A submissive pup will most likely lick at your hands or face, squirm around and/or roll over to show his tummy. An independent pups might 'freeze' or simply move out of reach. A docile pup is most likely to wriggle or whine at first, he might even 'freeze'. But he should soon relax and lick at your hands or try to get close to you. Method 2: Pick the puppy up and hold him on his back in the crook of your arm like you would a baby. Put the other hand gently but firmly on his chest and make direct eye contact (keep your gaze relaxed and non-threatening). A dominant pup will most likely start squirming as soon as you turn him over. He might growl or nip at you. A submissive pup might wriggle too - for a few seconds. He'll probably make intermittent eye contact and might try to lick at your hands. If he gets scared he'll squirm around trying to get free. An independent pup probably won't struggle, or will only do so for a few seconds, then he's likely to just freeze. Most likely will avoid eye contact. A docile pup might not object at first, or for long, or he may wriggle a little. He'll be calmed by eye contact and should relax in your arms. Method 3: With puppy standing in front of you, place your hands under his tummy and gently lift him up so that his paws are a few inches off the ground for about 30 seconds. Be sure to hold him firmly but gently so that he doesn't feel insecure - that will skew the results. A dominant pup will struggle, and probably keep struggling. He might twist around to try to nip at you or growl. An independent pup is most likely to just freeze, no resistance but no calm acceptance either. A docile pup might wriggle at first but will soon relax and settle. Might try to lick at your hands. Method 1: With the pup on the ground let him wander around for a 30 seconds or a minute. Ignore him until he's not paying you too much attention. Then crouch down and encourage him to come to you. Call him, talk to him, clap your hands gently, hold your arms open... be as appealing as possible. A dominant pup usually comes right away, probably at full gallop. He might jump up at you, paw at you, nip at your hands or pants and generally make a nuisance of himself. A submissive pup will take a lot longer to get up the courage to approach you. He will come, but may 'creep' in with his belly low to the ground. He might even pee a little as he gets close to you. Seems anxious. An independent pup will most likely ignore you! If he does come it will be in his own time but not because he's scared, because he's busy doing his own thing. A docile pup will usually come to you quickly and happily. He'll be excited and may lick at your hands or face, but he shouldn't be pushy. Method 2: Crouch down beside the pup and stroke/talk to him for a few seconds. Then get up and walk away slowly. Move at a normal pace and don't encourage him to follow you, but make sure he sees you. A dominant pup will race after you, probably wind around your legs and trip you up. He might bite at your ankles or pant legs. A submissive pup will think for a few seconds then will most likely follow you. He might not catch you up entirely, or will just get there slowly. An independent pup probably won't follow you at all. He may stay where he is, or wander off in a different direction.